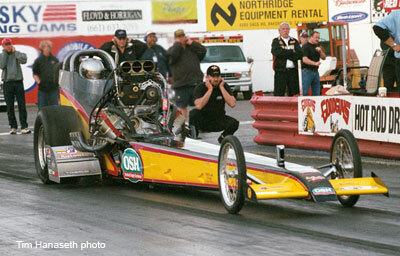 The 2004 Goodguys-VRA racing season came to an abrupt end when a strong rain storm hit the track just as Jim Murphy and Jack Harris were staging for the Top Fuel final. After two days of unseasonably cold weather and countless oil downs, it was called a draw and the prize money was split. 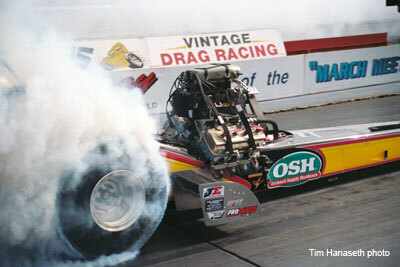 Since only one final had been run (Top Fuel B-Field) that left all the other classes without a clear winner as well. Thus ended a less than satisfactory season for Murphy and the WW2 Racing team. For myriad reasons that in no way constitute an excuse, the 2003 World Championship team unraveled soon after the VRA March Meet (which they won) and never quite jelled for the remainder of the 2004 season. In spite of finishing # 2 in the points standings and losing OSH as a primary sponsor, Murphy vows to be back in 2005 to take the championship back for an unprecedented 5th time. 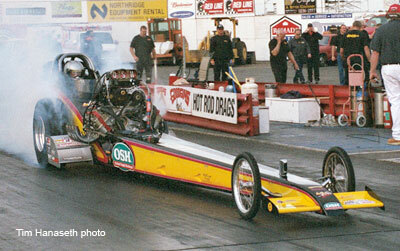 That said, here is the race report from the 2004 VRA Fuel & Gas Championships. Being one of the rare two day meets, the Finals offered only 2 qualifying sessions. The first started at 11:00 am Saturday morning and Murphy chose to near the end of the session. Jim Murphy sporting the # 1 on his car for the last time (for at least a year) was paired with rookie, Brad Thompson. Murphy laid down a great pass (5.822 @ 253.59) but made a severe sacrifice to the Aluminum gods at the top end. The car sounded flat for the last 200 to 300 feet and then disappeared behind a wall of white smoke. 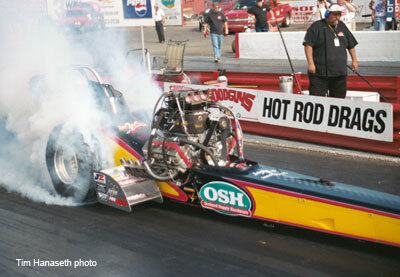 Thompson got loose right after 60 feet, spun the tires very hard, and clicked it to a 9.274 @ 91.54. The WW2 Racing dragster had a mechanical problem on their second qualifying attempt but it made no difference, Murphy still ended up in the # 1 spot based on his first effort. For openers, this shot kind of sums up the A&O (accidents and oildowns) day the Goodguys crew had to deal with on Sunday. 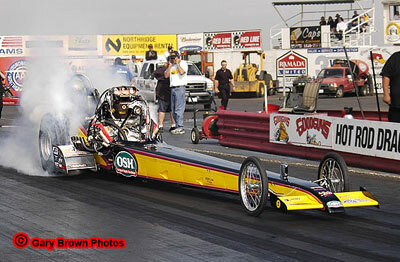 A top end accident in the Hot Rod class pushed first round of Top Fuel back 45 minutes and it went down hill from there. In the first round of eliminations Murphy was paired up the rookie phoneme, Mendy Fry. After Bellemeur's DNQ, Fry was the only Plaza Hotel car left in the show. Well, that didn't last long. 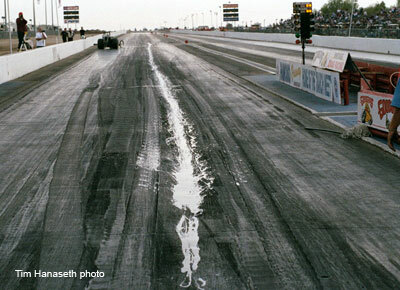 As Fry staged an oil line broke and covered the starting line. Fry moved up against the guardrail in her lane while Murphy ignored the whole mess and laid down a nice 5.837 @ 251.88. After another very long clean up from an A-Fuel incident, the first pair out for round two was Jim Murphy and Terry Cox (no photos). By all accounts the wait was worth it That was worth the wait as both cars were side by side until about 1000 feet when Murphy pulled ahead for the win. 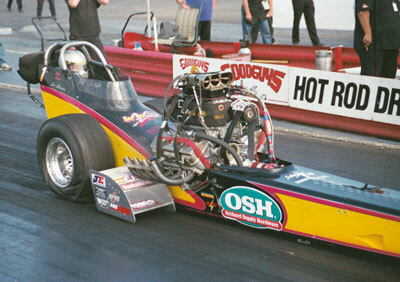 The clocks said: Murphy 5.942 @ 248.00 and Cox with a career best 5.962 @ 249.51... just missing the 250 MPH Club which Murphy was the first to establish back in 1999. The big dog final was to feature the biggest dogs of all - Jim Murphy and Jack Harris. 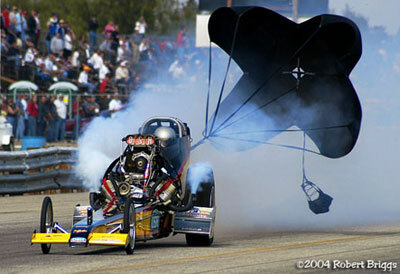 But as mentioned on the header, the final round of Top Fuel was called a draw when rain halted the event. The race will not be re-run or made up.